More than a year after a law was signed requiring them, child-detection sensors are still not installed on most new school buses in New Jersey because regulations on how to implement it have not been approved, according to the Associated Press and the Press of Atlantic City. Gov. Chris Christie signed Abigail's Law in January 2016. 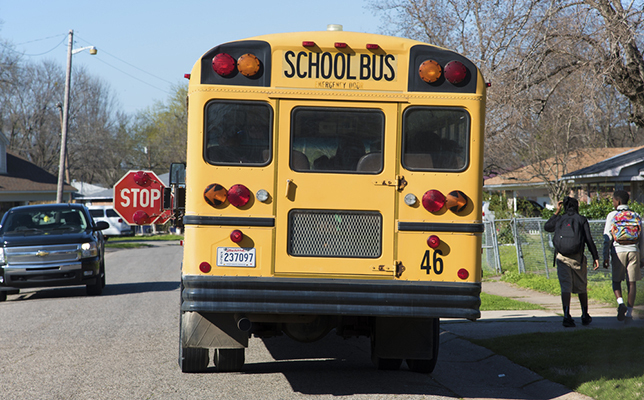 It requires that all school buses manufactured after July 17, 2016, come equipped with child detection sensors that would sound an alarm if a child were to run in front of or behind the bus. The law is named after 2-year-old Abigail Kuberiet, who was killed while crossing in front of a school bus in 2003. Earlier bills failed largely due to the lack of technology at the time, but the final bill in 2015 earned widespread support. The Press of Atlantic City reports that the Department of Education (DOE) sent a memo to school district administrators in May saying it was working with the state Motor Vehicle Commission to develop the regulations, and until then, manufacturers should "comply with the statute's requirements as they see fit." The state Board of Education proposed regulations in September, which were published for public comment. But no further action has been taken. The proposed regulations call for sensors that can detect the presence of a person or object in the front and rear of the bus. Schools also can add them on the sides, but that is not required. The system must include an audible and visible alert signal in the driver's compartment. The estimated cost is $1,750 to $2,500, depending on the system and the type of bus. State DOE spokesman David Saenz wrote in an email that the department is still reviewing the comments received during the public comment period and expects the regulations to go back to the state Board of Education at a future meeting. Meanwhile, local school officials are cautious. Warren "Skip" Fipp, transportation coordinator for the Egg Harbor Township School District, said they will not install the sensors until the state comes up with final wording in the specifications. "We do not want to spend $2,000 per bus and install a system that doesn't meet code," he wrote in an email to the Press of Atlantic City. A spokesperson for the Motor Vehicle Commission, which inspects the buses, said it cannot act on the law until the regulations from the DOE are in place. If regulations pass in the next few months, there could be a mad rush to install them over the summer. Joseph Callavini, transportation coordinator for the Vineland Public Schools District, said he has ordered 10 new buses for 2017-18 and built in the cost of the sensors. He expects companies will hold off until the last minute so they can try to deliver them with the sensors installed. He said another question is how the state will address buses manufactured after July 16, 2016, already on the road without the sensors, since districts would need time to retroactively install them, if required. Michael Gaborcik, national sales manager for Rostra Precision Controls, which makes a student detection sensor system, said the company has been in contact with manufacturers and is ready to install the sensors. He said a few bus manufacturers are installing systems based on the proposed regulations, but others are waiting. "What I foresee is that we will have a busy summer in New Jersey," Gaborcik said. "School districts will want it done so they can be ready for the new school year." For more on this story, visit the Press of Atlantic City.